He had 18 months cut from his jail term. A DRUNK DRIVER jailed for the death of a four-year-old boy has had 18 months cut from his jail term following an appeal. Finbarr O’Rourke (41), of Laurel Drive, Portlaoise, Co Laois, had pleaded guilty to dangerous driving causing the death of Ciarán Treacy (4) at Ballymorris, Portarlington on 17 April, 2014. Ciarán’s mother Gillian was also severely injured as a result of the incident. Judge Keenan Johnson sentenced O’Rourke to seven-and-a-half years imprisonment at Portlaoise Circuit Criminal Court on 3 November, 2015. The Court of Appeal resentenced O’Rourke to eight years imprisonment with the final two suspended today following an appeal. Giving judgment in the three-judge court, Justice Alan Mahon said Gillian Treacy was driving her car on the R419 between Portlaoise and her home in Portarlington, Co Laois, on the afternoon in question. At Ballymaurice she was confronted with a Toyota Avensis crossing the road and colliding head on with her vehicle. That car was being driven by O’Rourke, who was observed slouched over his steering wheel by Treacy shortly before impact. The woman received very serious personal injuries, and despite the best efforts of emergency services, her young son Ciarán, aged four, died that evening at Portlaoise Hospital. “Her seven year old son Seán, thankfully, escaped physically unscathed,” Justice Mahon said. Forensics suggested that there was no braking on the part of O’Rourke’s vehicle and that it was being driven at 86km/hr in an 80km/hr zone. After the collision, Treacy recalled O’Rourke approaching her vehicle. However, he walked away and was met on the road by gardaí in a distressed state and was arrested. He untruthfully told gardaí that he had consumed two glasses of wine. On being informed that the young boy, Ciarán had died, he smashed his head through a glass window in the garda station. O’Rourke had drunk between eight to ten pints of cider over a few hours that afternoon with a Mr Smith. While he was walking away from the scene, he telephoned Smith a number of times and told him there had been an accident and that he believed someone had died. He also asked Smith to come and collect him, the judge said. In her victim impact statement, Gillian Treacy detailed her own “life threatening and life long” injuries, including four serious fractures, severe lacerations, and her five week stay in hospital including ten surgical procedures. “The statement also speaks in the most moving terms of the extent of the family’s terrible loss of their adored young son, Ciarán, and how it has changed their lives forever,” the judgment stated. The statement also outlined the severe financial consequences visited on the family in the aftermath of the accident. O’Rourke’s barrister, Conor Devally SC, submitted that the sentencing tariff of nine years was too high and not enough credit was given for due mitigation. Justice Mahon said it was suggested on O’Rourke’s behalf that the offence was not pre-meditated. 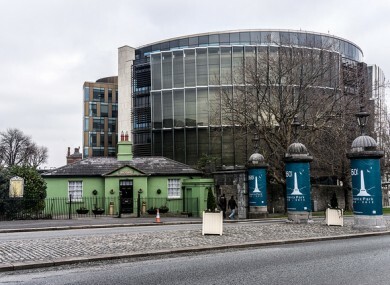 But while the appellant (O’Rourke) may not have planned to drive with alcohol on board for any great length of time before doing so there was pre-meditation in the sense that, having consumed a great deal of alcohol, he made the conscious decision to leave the public house, walk to his car and then drive for some time before the collision occurred. Justice Mahon said the fact he walked away from the scene in circumstances where he was aware that somebody had probably died and “in circumstances where he must have been aware that Gillian Treacy was severely injured” were aggravating factors. While he was less than truthful with the gardaí, it is “nevertheless in his favour” that he co-operated with them thereafter pleading guilty at a relatively early state. He had also shown remorse which the court accepted as genuine. Although almost insignificant in comparison to the devastating and life long trauma visited on the victims in this accident, the appelant (O’Rourke) will himself have to live with the awful guilt which undoubtedly he feels for the rest of his lifetime. Justice Mahon said the maximum sentence for dangerous driving causing death was 10 years imprisonment. “Interestingly, by contrast, in the UK, it is fourteen years,” Justice Mahon noted. He said it was desirable and appropriate that there be a degree of consistency in sentencing for particular offences. He said the Court of Appeal’s efforts to establish consistency in sentencing for what might be described as broadly similar offending may appear clinical or “even callous” to the victims of “such a terrible event, as this was, but” it was necessary to achieve as much consistency as was reasonably possible. The Court of Appeal was satisfied that there was an error in principle by the Circuit Court judge in placing the headline sentence at nine years, primarily because of the absence of prolonged period of dangerous driving or excessive speed. Justice Mahon, who sat with Justice George Birmingham and Justice Garrett Sheehan resentenced O’Rourke to eight years imprisonment with the final two suspended. The period of suspension was primarily intended as a recognition of O’Rourke’s “genuine remorse”, plea of guilty and to incentivise rehabilitation. The court also re-imposed the disqualification period for twenty years. His head hung low, O’Rourke made no reaction when the judgment was delivered. In a statement read outside court, John Browne, on behalf of the Treacy family said “words cannot express their anger, their grief or their revulsion towards the drunk driver who robbed Gillian and Ronan of their beloved son” and their children “of the brother they deserved but now will never have”. “The family are disappointed, but respect and acknowledge the court’s judgment”. Email “'Words cannot express the family's anger': Drunk driver who killed boy (4) has sentence cut”. Feedback on “'Words cannot express the family's anger': Drunk driver who killed boy (4) has sentence cut”.